We design & develop various types of industrial ball valves, 3 way ball valves process, stainless steel ball valves, ball valve NPTF, ball valve ODT ends, ball valve 3 piece design, high pressure ball valves, flanged end ball valves, panel mount ball valves and 3 way ball valve ODT ends etc., are some of the types of ball valves offered by us. Made using stock bar and forgings these high pressure ball valves, stainless steel ball valves improved dimensional stability, precision in function and durability. We make use of SS 316/SS 304/CS/ Brass with SS working parts for ensuring optimum functionality of all our industrial ball valves like stainless steel ball valves and brass ball valves. The rugged body and floating ball of the valve is machined with high accuracy. We also provide custom designed brass, monel and stainless steel ball valves and panel mountings if required by the customers. End Connection : NPT / BSP / SW / BW / and flanged as per BS-10 ASA and Din standards. 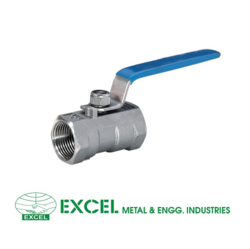 Pioneers in the industry, we are offering an excellent range of Ball Valves. The offered ball valve is accurately by our skilled workforce using high quality basic material & highly advances technology as per the market standard. This ball valve is properly inspected on from each side in order to ensure its flawlessness. 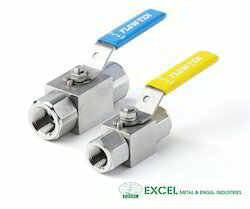 As well, our customers can also avail this ball valve from us in various specifications to choose from. We are manufacturing FP ball valves where in the ball of the valve is over sized and by which we can have the hole of that ball same as what of run pipe. The main purpose of this design is to have unrestricted flow with lower friction loss, but these ball valves are comparatively bigger in body size and ultimately this impact on price. We are manufacturing RP ball valves which is also called as reduced bore ball valves where in the ball of the valve have one size smaller hole while comparing to run pipe where this ball valve have been installed. 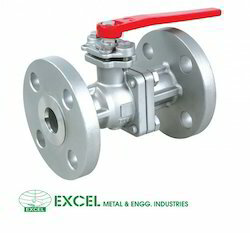 Metal seated ball valves are specially designed according to actual working services or customer’s requirement. This type of valves can be used in adverse working services and it is best suitable for the bad working services requirement such as high temperature, high pressure, strong corrosion and medium with grain, etc. High-Pressure Hydraulic Ball Valve. 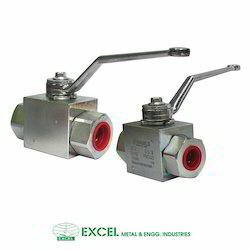 This Hydraulic Ball Valve is manufactured by using a quality material as per the industry standards. In addition to this, the ball valve can also be customized as per the specific requirements of customers. Size 1/4 " to 2 "
High Pressure Ball Valve to our clients. These High Pressure Ball Valves offered by us are available in different customized specifications such as sizes, shapes and allied with respect to the diverse requirements of esteemed clients. In addition to this, the offered High Pressure Ball Valve is checked on different characteristics to maintain its authenticity throughout the designing process. Size 1/2 " to as per req.